Mahadev gifts pearl of love necklace to Gowri. Gowri asks Mahadev to help her wear it. He does. They both leave. Radha questions Krishna how did Gowri know about his and Chandravali’s plan. Krishna says everyone knows except her. Radha gets angry and runs behind him. Their nok jhok starts. After sometimes, Radha gifts a beautiful handcrafted cloth to Chandravali to thank her for making her realize the value of true love. Ayan gets angry seeing his plan failed and Radha/Krishna uniting. Jatila says she knew from before that they cannot separate, but she cannot understand why Krishna is hesitating to kill Kans when is Kans’ end. Kans smiles thinking he got a solution for his problem. He orders his soldiers to fight with him and killing them says he is most powerful in this world and can kill anyone, he will not spare even Radha and Krishna. Ayan gets angry and warns him dare not to take Radha’s name. Guards catch him. Kans provokes to fight him and show his anger, he will either win Radha or die. Krishna gets ready to meet Radha and looks at his gift. Balram enters and asks where is he going and what is in this box. Krishna says nothing and misleading him runs out and calls parents. Parents get ready to go to Barsana. Balram acts as ill to skip traveling. Rohini gets concerned. Krishna says maiya Rohini cannot serve Dau for long, so she should get a bahu. Balram says he is fine and let us go now, if he does not want to meet Radha. Krishna says yes..
Ayan fights with Kans. Kans easily overpowers him and throws him on ground. Jatila pleads to spare Ayan. Kans walks to Ayan and raises his foot to kill Ayan. Jatila shouts in fear, but Ayan does not deter. Kans stops and says he likes his confidence and wants fearless people like him. He orders to kill Vrishbhan if he wants to get Radha. Radha takes care of feast preparations. Vrishbhan gets emotional seeing that and says he needs to talk something important. Radha says she will speak to him later as Krishna’s family will reach anytime. Vrisbhan insists. Radha says she will finish her work and then father and daughter will have a long chat. Kirtida asks Radha why she is working so much today. Radha nervously says she does always. Kirtida says she is her mother and knows what she is up to. Krishna while traveling smiles thinking Kirtida aunty caught Radha red handed. Radha says guests are coming from Vrindavan. Kirtida says guests usually visit from Vrindavan, what is special today. Krishna thinks before Radha feels more embarrassed, he needs to rescue her. He plays bansuri. Radha excitedly runs saying Vrindavan guests came. Nand’s family enters greeting Kirtida and Vrishbhan. Krishna meets Radha and offers her gift. Radha asks what is this. Krishna says a lovely gift for lovely Radha. Radha checks gift. The both walk looking at each other romantically. Krishna then goes and sits with Balram while Radha sits with Yashoda. Balram taunts Krishna. Krishna goes and sits next to Radha. Ayan enters Vrisbhan’s house to kill him and cuts balcony railing. Krishan senses that. Krishna gives moral gyaan that it is more important in life to know what they lost than what they gained; before traveling, one should plan well as unplanned travel will misguide them; one should not get arrogant after success; one should not get too proud of themselves. Precap: Vrishbhan sees someone/Ayan near balcony railing and asks who is it. Ayan hides. Vrishbhan slips on oil and falls from balcony. Krishna notices that. 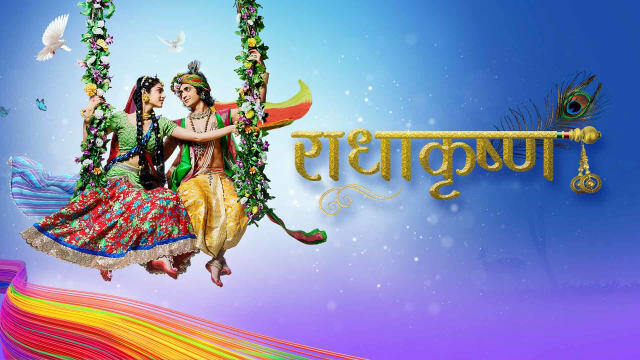 The post RadhaKrishn 12th March 2019 Written Episode Update: Ayan Battles Kans appeared first on Telly Updates.